Laughing. Laughing. Forced, hollow, soulless laughing. A small friend pulls a single mom out of poverty while facilitating her marriage to the ghost of her baby daddy so they can all finally move on. Man who turns out to be a combat medic. Character betrays friends to side with boyfriend. Then proceeds to fight friends. I don't think this is from a specific scene but my boy Geralt thinks it is a bit chilly out there. Yup, Witcher 3. Geralt says it when a storm or w/e begins. 1. Betrayed by your former ally, you fight to stop a terrorist plot with your wife by your side. 2. You stand in the wizard’s laboratory, the machine dormant. Reaching into your pockets, you pull out a piece of moldy cheese and thow it into the vat at the machine’s base. Suddenly, it springs to life! A young woman vomits a fetus. As it writhes on the ground, an older woman picks it up like, “Well if you don’t want it...” and eats it. And God was born. Each of your vehicle's six wheels is jostled by the barren, buckled and custed surface, the carbon filament tires nearly indestructible, but still subject to the brutal energies and physics of racing across this sun blasted plain, Earth, a tiny crescent in the sky. Ahead, a slight rise may hide a chasm or crater. Above, an interceptor craft is preparing to fire. You have one shot at this - accelerate and pray your rattling jalopy makes the leap, or man the cannons and eliminate this alien bird of prey. Inside your freezing cockpit, the music plays on, unperturbed by the horrors outside. a guy shouts another guy's name and then they go running around a tree after each other in the conclusion of this thrilling story. Hero goes back to his hometown, the locals all hate the hero, one of them challenges the hero to a fight and gets disarmed easily and tells the hero to do what he is here to do and then never come back. - On the day of marriage, bridesmaid stabs friend to death, drags body to another room, changes into friend's dress and gets sent to an asylum. "But it's supposed to be like that"
You enter the shop. You walk to a closet but cant open it. The shopkeeper tells you to step away from the closet but you dont care. You just keep going which leads to the shopkeeper telling you a never-ending story. 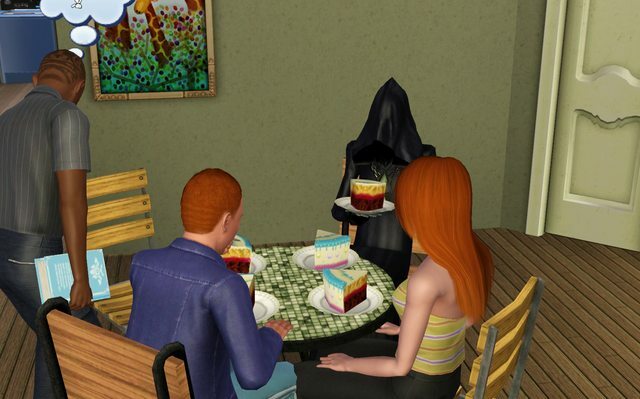 A teenage girl is holding a birthday party when the Grim Reaper shows up, grabs a slice of the birthday cake and sits down at her table. After talking about the weather with her for an hour, the Reaper excuses himself and goes off to collect her elderly neighbor who had collapsed on the front lawn. A guard at the warehouse you're traveling through kindly advises you to leave followed by announcing your profession. Your looking for treasure but end up killing 100’s of people and stopping some kind of voodoo magic everytime and somehow your the hero but really your just a hypocrite but your beloved and good looking you get a free pass. You, a humanoid, converse with a spider and agree to feed it the limbs of strangers. - The party you threw at your place is over, all guests left and you just finished throwing up in the bathroom. You just want to crawl inside your bed but your wife won't let you unless you take care of the mess in your house first. Edit - quoted the wrong person by mistake. A man mourns his lady love, whom he himself had just struck down in battle, in one of the most infamous scenes in gaming history. You help a lady detective track down the source of illegal fruit smuggling, but it somehow escalates to a showdown against the local feudal ruler on the rooftop of his castle. A warrior draws a mighty sword from the dragon's back, freeing it from imprisonment. Thanking the warrior, the dragon carries the warrior across the sea. Later, the warrior stabs the dragon with that same sword. That's all you are getting. Someone will get it with just that alone. - Guy creates a virtual reality in order to manifest his dead sister in it through his memories. - Various people engage in and act out a proper finger gun fight throughout the scene until the narrator gets his story straight.